Carbon dioxide levels in the atmosphere are accelerating. As illustrated by the image below, a linear trend hardly catches the acceleration, while a polynomial trend does make a better fit. 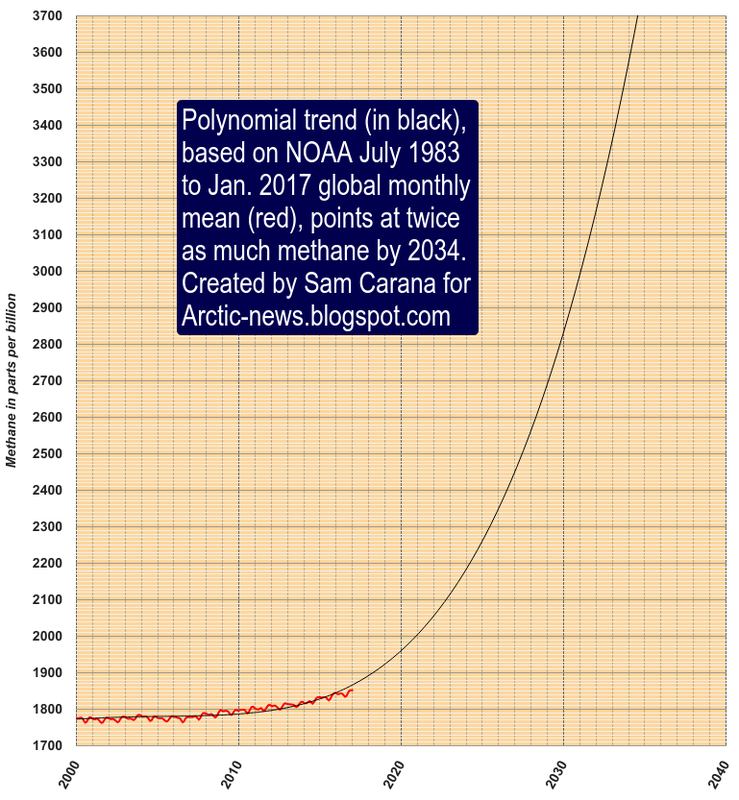 The polynomial trend points at CO₂ levels of 437 ppm by 2026. This worrying acceleration is taking place while energy-related have been virtually flat over the past few years, according to figures by the EIA and by the Global Carbon Project. So, what makes growth in CO₂ levels in the atmosphere accelerate? As earlier discussed in this and this post, growth in CO₂ levels in the atmosphere is accelerating due to continued deforestation and soil degradation, due to ever more extreme weather events and due to accelerating warming that is making oceans unable to further take up carbon dioxide. 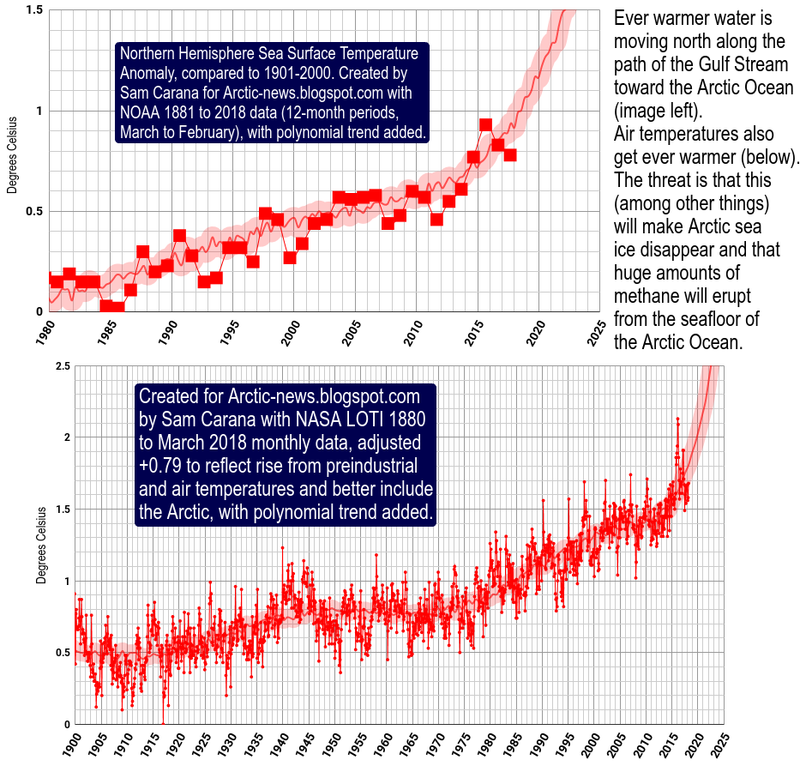 Ocean warming is accelerating on the Northern Hemisphere, as illustrated by above image, and a warmer Atlantic Ocean will push ever warmer water into the Arctic Ocean, further speeding up the decline of the sea ice and of permafrost. Loss of Northern Hemisphere snow cover is alarming, especially in July, as depicted in above image. The panel on the left shows snow cover on the Northern Hemisphere in three areas, i.e. Greenland, North America and Eurasia. The center panel shows North America and the right panel shows Eurasia. While Greenland is losing huge amounts of ice from melting glaciers, a lot of snow cover still remains present on Greenland, unlike the permafrost in North America and especially Eurasia, which has all but disappeared in July. Worryingly, the linear trend in the right panel points at zero snow cover in 2017, which should act as a warning that climate change could strike a lot faster than many may expect. A recently-published study warns that permafrost loss is likely to be 4 million km² (about 1.5 million mi²) for each 1°C (1.8°F) temperature rise, about 20% higher than previous studies. Temperatures may well rise even faster, due to numerous self-reinforcing feedback loops that speed up the changes and due to interaction between the individual warming elements behind the changes. 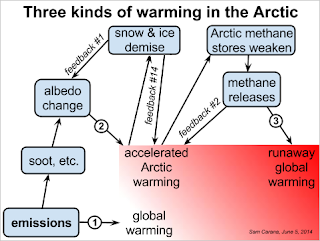 One of the feedbacks is albedo loss that speeds up warming in the Arctic, in turn making permafrost release greenhouse gases such as carbon dioxide, nitrous oxide and methane. Higher temperatures on land will make warmer water from rivers enter the Arctic Ocean and trigger wildfires resulting in huge emissions including black carbon that can settle on sea ice. Given the speed at which many feedbacks and the interaction between warming elements can occur, Arctic sea ice volume may decline even more rapidly than the image on the right may suggest. 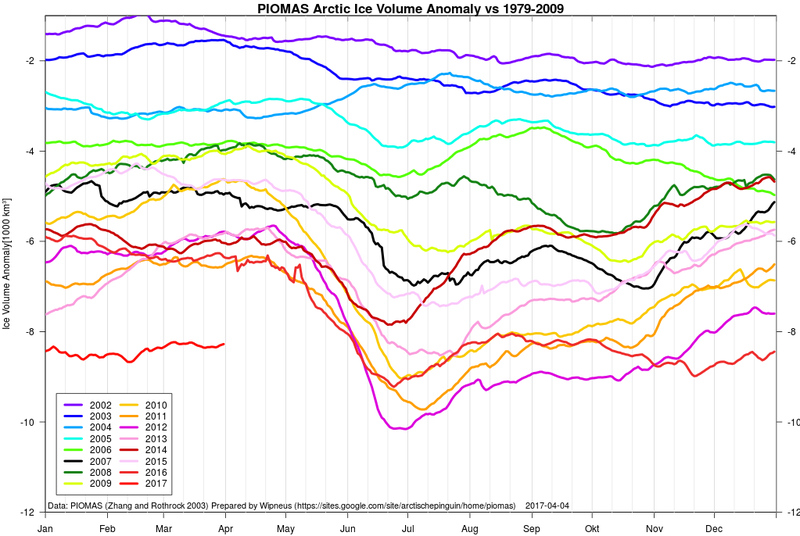 Ominously, sea ice volume anomalies have been at record levels for time of year since end 2016 (Wipneus graph right, PIOMAS data). As the Gulf Stream pushes warmer water into the Arctic Ocean, there will no longer be a large buffer of sea ice there to consume the heat, as was common for the entire human history. Moreover, forecasts are that temperatures will keep rising throughout 2017 and beyond. 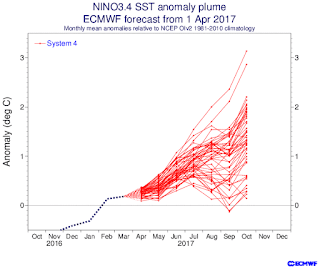 The Australian Bureau of Meteorology reports that seven of eight models indicate that sea surface temperatures will exceed El Niño thresholds during the second half of 2017. The image on the right, by the ECMWF (European Centre for Medium-Range Weather Forecasts), indicates an El Niño that is gaining strength. For more than half a year now, global sea ice extent has been way below what it used to be, meaning that a huge amount of sunlight that was previously reflected back into space, is now instead getting absorbed by Earth, as the graph below shows. Where can all this extra heat go? Sea ice will start sealing off much of the surface of the Arctic Ocean by the end of September 2017, making it hard for more heat to escape from the Arctic Ocean by entering the atmosphere. 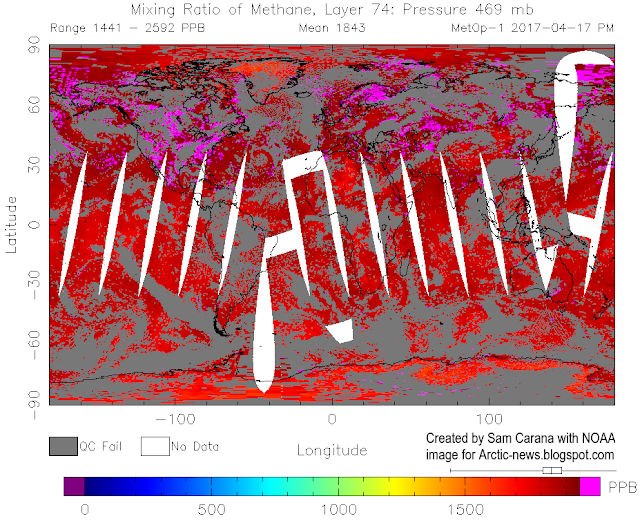 It looks like much of the extra heat will instead reach sediments at the seafloor of the Arctic Ocean that contain huge amounts of methane in currently still frozen hydrates. 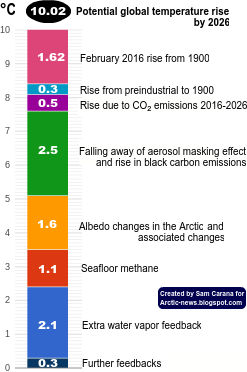 The danger is that more and more heat will reach the seafloor and will destabilize methane hydrates contained in sediments at the bottom of the Arctic Ocean, resulting in huge methane eruptions. 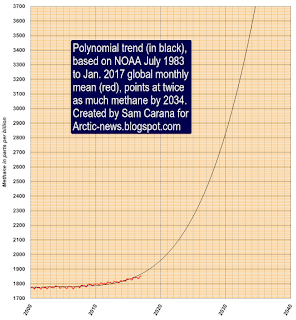 As the image on the right shows, a polynomial trend based on NOAA July 1983 to January 2017 global monthly mean methane data, points at twice as much methane by 2034. Stronger methane releases from the seafloor could make such a doubling occur much earlier. Meanwhile, methane levels as high as 2592 ppb were recorded on April 17, 2017, as shown by the image below. The image doesn't specify the source of the high reading, but the magenta-colored area over the East Siberian Sea (top right) looks very threatening. We already are in the Sixth Mass Extinction Event, given the rate at which species are currently disappearing from Earth. When taking into account the many elements that are contributing to warming, a potential warming of 10°C (18°F) could take place, leading to a rapid mass extinction of many species, including humans. How long could it take for such warming to eventuate? As above image illustrates, it could happen as fast as within the next four years time. Your before and after 2012 graphic is perfect. Even our new Commander-in-Chief could understand it's meaning. If you don't mind, I'm going to make a bumper/refridgerator sticker of it. Thanks. Good idea, thanks. Watch out for bumper-to-bumper collisions, though! Great work explaining facts to us us citizens in ways we understand. Many thanks. And get those bumper stickers on the market fast. Your posts are always frightening but fascinating. Thank you for your work. I was really hoping I was wrong when I did my own assessment. This is beyond dire. 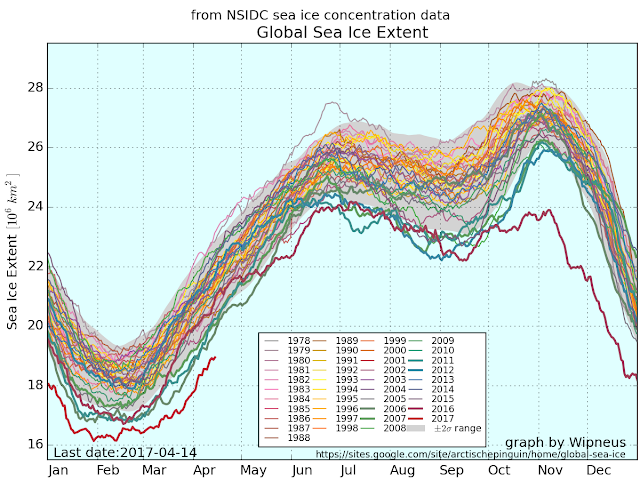 The pattern in the ice accumulation and loss appears to be mimicking 2012's anomalies. 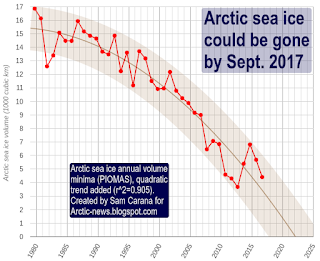 At this rate, yes we may very well see an ice free Arctic this September. The thing that troubles me the most is the fact I've been saying timelines like this for the past few years now. Compared to other estimates a couple years ago, my forecast for the apocalypse was much sooner in comparison. So what if we're both wrong? What if we've got less time left than that even? How far beneath the surface can a human survive when the temps hit 120°F? Can a structure support life on the surface at temps like that? The summer of 2018 is very likely to be the hottest on record. The summer of 2019 will be hotter. And the summer of 2020 will be hotter still. By the summer of 2021, the Big Heat will arrive and kill hundreds of millions, maybe a billion. Every continent will be greatly affected. Mass panic will ensue. Panic behavior will bring about a bad end for humanity. Panic is unpredictable and untimely so maybe it will come sooner. Huge methane blobs will run rampant crisscrossing the land, magnifying the heat, along with CO2 potency, and water vapor holding it in. Tropic-like heat will overcome systems. The atmosphere will sustain new peaks and valleys. We will be like the frogs in the proverbial slowly boiling pot. In heat with humidity, lives are in danger and tempers flare. Driven by the heat, super storms will cross every land, everywhere. Earthquakes and volcanoes, predicted by new techniques to come to renewed life beginning in 2018, causing tsunamis and landslides. Super hurricanes have already raged. Droughts and wildfires will destroy almost all crops and forests. Fruit and fish will die off completely. It will all be over before we know it. No animal or plant will survive by 2026. Humans will be long gone by that year. A few species of insects will last a while, a few species of plants and fungi will carry on. Bacteria will feed and flourish. When human technology breaks down, the 450 nuclear power plants will go into meltdown. Prior to that and more importantly, radioactive materials in storage will burn and blanket the earth. Before that, the likelihood of nuclear exchanges will increase enormously that the US or a client state will first-strike an enemy. Mere toxicity will seem like a minor problem although poisons and toxins and radioactivity of every stripe are certain to kill us over time. CH4 and CO2 pollution got us first. The Big Heat will kill everything. Radiation will sterilize. Toxins will corrupt. 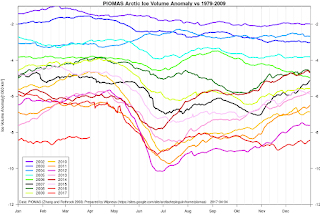 Technically, an Ice free Arctic is not very likely this summer in the Arctic because we can expect rapid Glacial caving and deglaciation like man has never seen before. What will happen in Greenland if it loses 100 feet of surface ice and the melt water pores into the interior of the land mass. That water will rip the ice sheet apart. Glaciers will pour into the Arctic and Atlantic Ocean. It is sorta like the planet bleeding out. I have been assessing this mess as most of us in the Northern Hemisphere will not see 2020. Everyone will see the freight train coming at us this summer. We will all know we are living on borrowed time that has just run out. The great dying is upon us. 10°C or 18°F warmer by 2021?